sailboat. : A little skincare loot & looking for advice! With my skin becoming even more sensitive and irritable I decided that I needed a little skincare overhaul to see if I can calm it down a little bit and generally even out my skin tone. I have very fair skin that is by no stretch of the imagination clear or smooth, I get blemishes on my chin sometimes but that's nothing a little bit of witch hazel can't sort out. I have a few old acne scars that I'd like to try and tone down as much as possible and I have, what I think is, rosacea. I get a lot of redness on my cheeks and sometimes something that resembles a rash which honestly, isn't pretty to look at. My cheeks are also the driest parts of my face & often just slapping on the concealer and an extra layer of foundation just makes it look a whole lot worse. Ultimately I'd describe my skin as both temperamental and sensitive so I raided the skincare aisle of Boots today but I did already have a couple of brands in mind after doing a little bit of research before hand. Does anyone else sometimes get really overwhelmed by all the choice? I still absolutely love my Neal's Yard Chamomile Cleanser & will be repurchasing it when I run out but I'd really like to find another cleanser that I really love as well. I'm no dermatologist (obviously!) but I do think that sometimes a bit of a change is good for your skin. 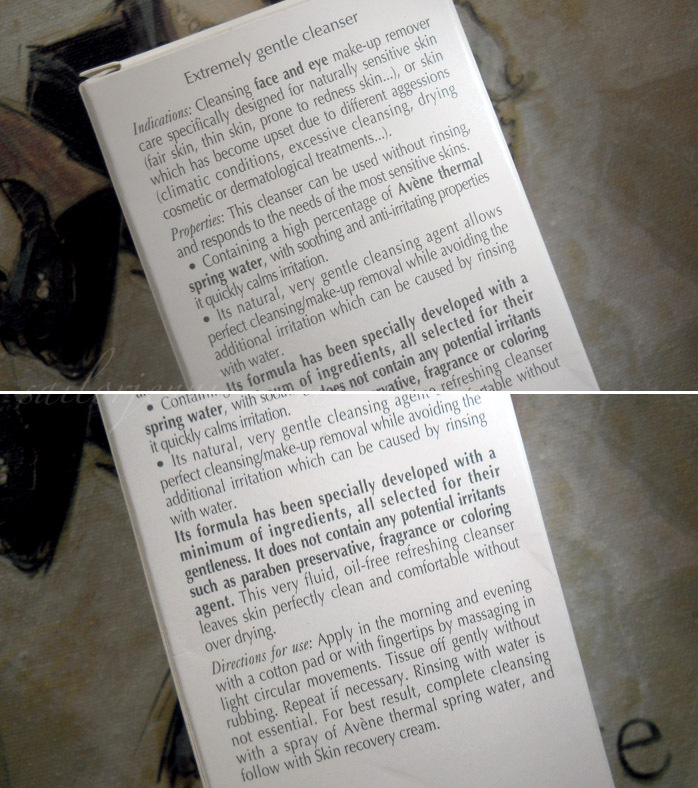 I've heard a little bit about the Avène Extremely Gentle Cleanser before and it sounds like the type of product I'd really like. It's free from parabens and fragrances and is specially formulated with sensitive skin in mind. I'm hoping that the high content of thermal spring water will deliver the soothing properties that the packaging says it will. I've never been a particular fan of cleansers that you remove with tissue or cotton pads, favouring instead to remove with a muslin cloth rinsed in hot water however I'm having major issues with the water here. I used to live in a super soft water area & since moving to a hard water area I've seen my skin get drier, my hair get oilier & it also tastes disgusting! It's essentially icky in my opinion I'm totally going to invest in a water filter asap! Anyway, perhaps not rinsing with tap water will help my skin? I don't know but I'm willing to give it a try. At just £8 for 200ml this seems like a fairly budget friendly cleanser so I'm hoping that I don't go through this bottle super quickly! As I was purchasing this my boyfriend took great pleasure in laughing at me because he can't understand why I'm buying a can that's essentially filled with water. 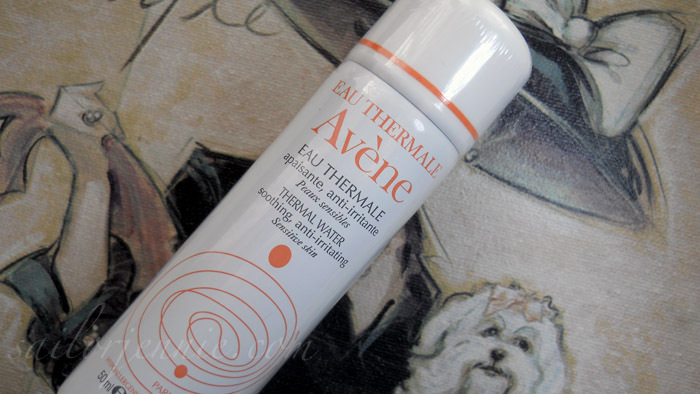 Directions on the Extremely Gentle Cleanser say that it's good to follow that step with a spray of the Avène Thermal Water. I know they say those things on packaging to encourage you to purchase the whole range but since this little can was only £3, I thought I'd at least try it out. Maybe I did get suckered in & perhaps it won't do anything special to my skin but you never know if you don't try! I also think this would be lovely just to have around in the summer if it ever gets unbearably hot & it could perhaps act as a little make up refresher/setter too! Honestly, I didn't really need another moisturiser because I have plenty already to choose from but none of them are really hydrating my skin as well as I'd like them to at the moment. 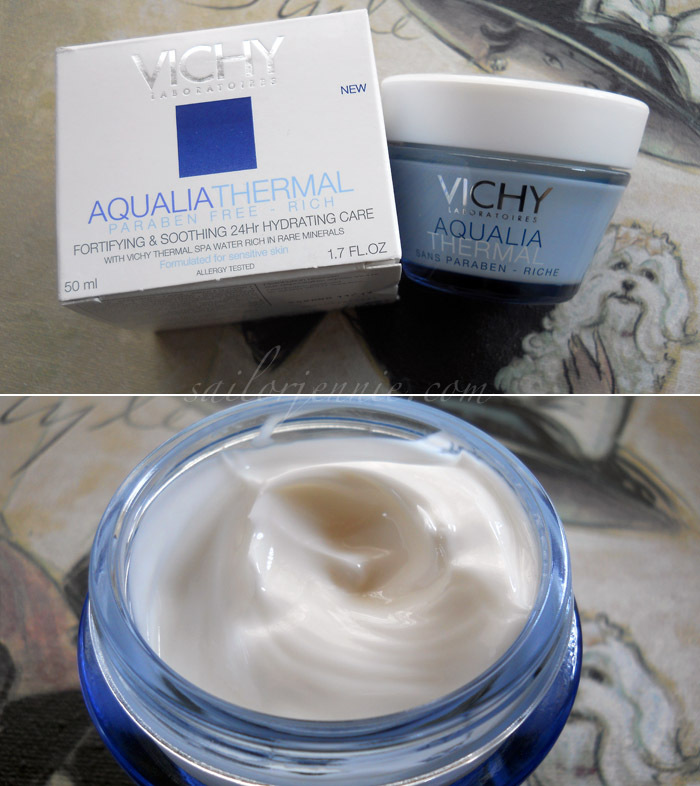 I saw the Vichy Aqualia Thermal Fortifying & Soothing Rich moisturiser and swiftly popped it in my basket before I could talk myself out of it. It's promises of soothing the skin while hydrating sound wonderful & I really hope that it delivers on those accounts! While it is a rich cream, upon first impressions it doesn't feel greasy and seems to absorb pretty quickly which is exactly what I look for in a moisturiser. The packaging is simple but sturdy and although a lot of people don't like creams in jars, I actually really do. I'm forever squeezing too much out of tubes and then it's wasted! Again, it's free from parabens and fingers crossed it'll manage to soothe my skin nicely! At £15.83 for 50ml this isn't cheap but I wouldn't go so far as to say it was especially expensive either & honestly, if it works, it's a price I'm willing to pay! I could have popped many more products into my basket but I would have ended up spending a small fortune & the sensible part of me thought that three new products was plenty! There's a soothing mask from Avène and a hydrating serum that I'd really love to try and I could have gone completely moisturiser happy because they all sounded lovely! Do you have a similar skin type to me? If so what are your must have skincare products? I'd really love to know because there seems to be lots of things on the market for oily skin and quite a few things for really dry skin but I've not found a lot that I think would be perfect for my skin type. I dont think men understand what we go through to keep our skin looking nice! I always had the impression you had pretty amazing skin from your make up posts! In any case, I never heard a bad thing about Avène, so maybe they'll be the solution to your problems! Difficult/sensitive skin runs in my family and it seems that all of my father's side and I have developed an allergy to parabens, so we have to take a careful look at the products we use. My father has recently undergone treatmean for his skin and developed a case of rosacea as well. The doctor advised him to use plain tea to help the problem! Use whatever sort of tea (darjeerling, asam etc) you have at home, leave two teabags soaking in a cup of water for four or five hours and in the evening, take a few scraps of gauze and soak them in the tea. Put those on your face for twenty minutes. It really works WONDERS. He was prescribed a whole lot of medicine but the tea treatment worked almost instantly! I do have some of the issues you mentioned but mostly, I used to work for a chain similar to Boots, so I got quite a bit of training on skincare. 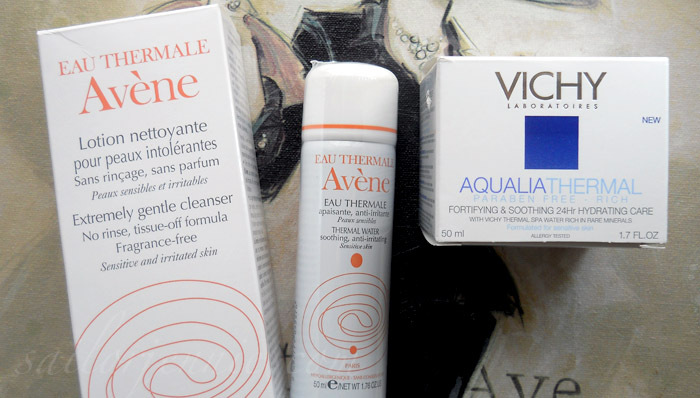 For your skin type, Avene is the best, and I've had good results with the Aqualia Thermal as well. Mask and/or serum would be a nice addiction to what you already got. Also you can do masks with thermal water if you have cotton sheet masks (you can find some on eBay), that will help. I had oily skin for years and then my skin became sensitive and just generally red and horrible. I really loved using Austrailian Bodycare's Tea Tree cleasing gel but it's hard to find. If you can get it it's certainly worth a try! I work as a skincare consultant in Boots and these are all products i'd recommend! I deal with this a lot each day actually :) If you need any more help with anything skin related, let me know. I might actually have some samples I could send for you. I've had full Avene and Vichy training too. Another brand which is good is La Roche Posay, very similar to them both. xo. I have really similar skin to yours, almost the same, so I know the annoying thing your going through! I got the Avene extremely gentle cleanser, the thermal water and skin moisturiser but haven't used them enough to give you a good review on it yet! I don't think they've broken me out though so that's always a good sign. If these don't work on you, you can always try Lush for skin care. Lush use natural products so great for sensitive skin. They're pretty much the only skin care brand that haven't broke me out, and I think it's because they're all natural. I feel your pain, I moved 2 years ago from North Yorkshire to Devon and my skin went from oily to dry and just gets worse and worse the longer we're down here. I've heard great things about both these brands but I've been waiting for more reviews on certain products before committing but I think I may just jump in and try them and urgh the water tastes awful down here too compared to where we used to live. Great post! I can't wait to hear how that cleanser works out. 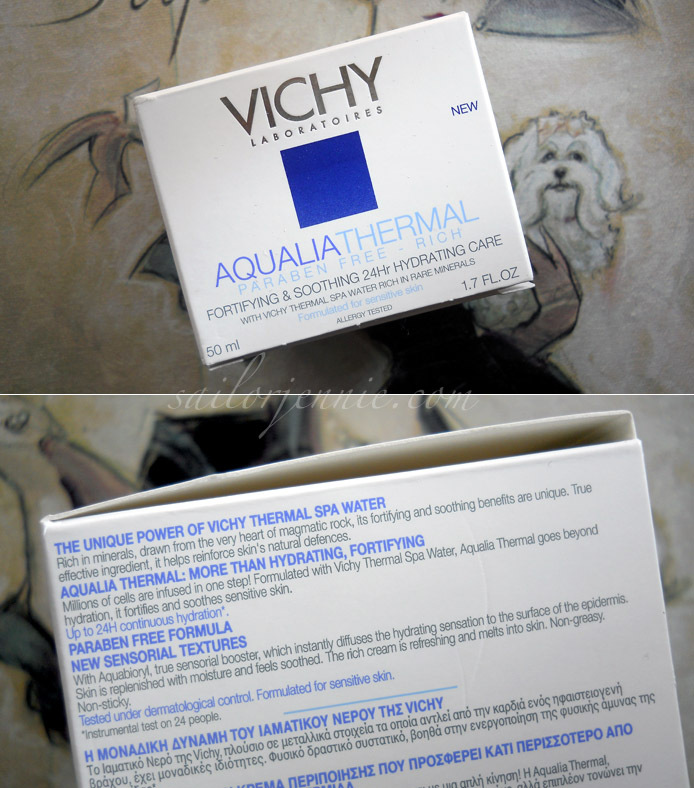 The Vichy cream also looks great..I might try it, but probably in winter since my skin is more oily in the summer. 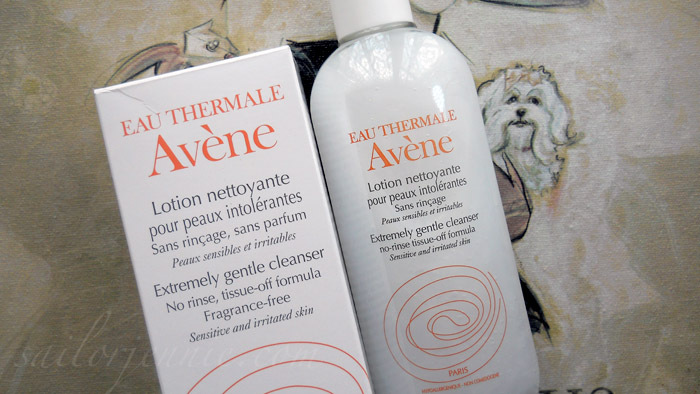 I love the look of Avene products, the packaging always makes them look so soothing. I think that spray would be excellent to bring on a plane for long haul flights too, skin always gets so dehydrated on flights! Are you allowed to bring sprays on planes? Oh I don't even know with all these crazy flight rules anymore!